Should I sell my investment property and cash out today - Has the Mississauga or Toronto market peaked? I get asked this question often. There is no simple answer. I know how you feel that it's tempting to cash out, prices are so high. This is a difficult question to answer precisely as really, nobody can predict what will happen in the future. 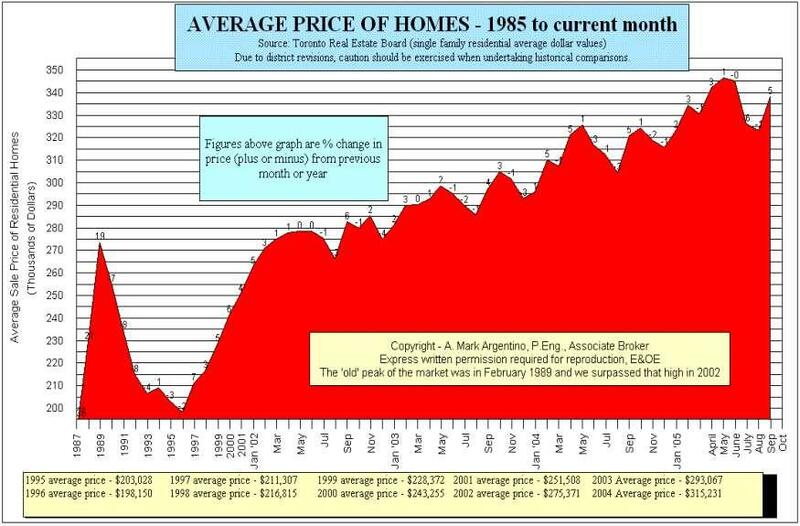 Many are now thinking that the market may have peaked in the GTA, but only time will tell. There have been a few articles written in the press lately about the over-abundance of condos currently on the market and more coming on stream in the next 2 to 3 years. This could potentially create a supply problem and prices could soften in the condo market. Regardless, if you have equity in your investment property, then I would understand that you may wish to take out the equity and move it to other investments that may give you a higher return over the next 5 years or so. Over the past 3 to 5 years or so the rental market in Mississauga has been very soft and I have noticed the quality of tenants has dropped significantly. This is due to our extremely low interest rates and many people that would have otherwise rented, purchased instead. The vacancy rate in the GTA is very high and this has impacted investment properties. I help clients with many of their rentals per year and I am finding it much more difficult to find good quality tenants over the past few years. Even if we have a correction in our market, I don't think it will be too significant. We are not in a boom similar to the investor fuelled boom of the mid to late 80's so I think (and hope) that we will not ever see the bottom fall out of the market the way we did in '89 to '95. So there you have it. I am sorry I cannot predict the market more accurately for you. When push comes to shove, you will have to make the final decision. All the best, and if you want more information, please email me. I guess it was only a matter of time, but the gasoline prices in Mississauga are yo-yo 'ing again, but at least they seem to be heading down as opposed to up! On October the 8th, prices were in the mid 90's and we all thought we had hit the jackpot. The photos below show prices under 90 cents per litre, actually saw a price at 88.8 cents per litre. Two nights ago I was coming home from two late appointments and saw the price on October 25th at the Petro Canada at the corner of Cawthra and Rathburn at 80.4 cents per litre. Yes, you are reading that correct, 80.4 Today, I drove past the same station and the price was back up to 89.9 cents per litre. This page is for fun and interest. You may click any of the photos below for a full size and more detailed picture. I know that you likely have gone through the same emotional swings as you have watched the gasoline prices "yo-yo" for the past years and escalate to incredible peaks in the recent past. I have started to keep an eye on prices as they reach these unprecedented levels and will report them below. As well, you will find a glimpse of prices around the world on this page and graphs showing how much more we are paying for gasoline compared to the average US price. As an aside, I fill up at Esso about 95% or more of the time. The reason for this is multifold. Back when Esso originally introduced the speedpass (I think it was 1999) I thought that the convenience of pointing an object connected to my key ring was much better than going into the store to pay with a credit card. As well, the speedpass was connected to my Visa and I would get Esso points and Visa points at the same time. Since I am on the road very often, as you know I am a real estate agent, I put about $2500 to $3000 of gasoline in my vehicle per year and I thought that the points would add up over the years. Another reason for using Esso is that there is an Esso located at the corner of Credit Valley Road and Erin Mills Parkway, about .4 km from my house. Again, very convenient. Another reason for me going to Esso (in general) is that they have Royal Bank banking machines and I bank with the Royal, so cash withdrawals were convenient. For anyone who lives north of Dundas or south of Britannia in the Erin Mills Area knows, there are zero branches of the Royal Bank (BTW-as an other aside, RBC is installing a branch near the corner of Eglinton and Plantation Woods - yeah!) in this entire area, so Esso is the most convenient location to obtain cash. This is called cross marketing by Esso and it brings in many customers who would otherwise go to competitor gas stations were it not for the Royal Bank banking machines. Probably, one of the most important reasons that I go out of my way to use Esso is the fact that they have Tim Horton's coffee. Many would agree with this fact and this is likely the number one reason why a large percentage of customers fill up with gasoline at Esso, Tim Horton's and convenience. Again, brilliant cross marketing on the part of Esso. Less than 2 years later and for the first time I saw gas at the corner of Erin Mills Parkway and Credit Valley Road over $1 per litre was on August 13, 2005 with the price posted at 101.9 cents per litre. Poor Esso across the street had to blank out their large sign and their price was posted on the small A frame board at the side of the road. I was amazed to see this high price and absolutely outraged at the same time. Hurricane Katrina made landfall in late August of 2005 and caused gas prices to escalate and in late September then Hurricane Rita made landfall on September 24th of 2005 and prices began to rise up to the stratosphere! This sign is from a gas station in Quebec. Days during Rita making landfall it was reported on ontariogasprices.com that the price fro a litre of gasoline was$1.76 per litre at Port Colborne Shell Gas station. People in my office and my wife's office were reporting that gasoline on the morning of September 23rd was $2 per litre in Barrie and by the afternoon of Friday the 23rd of September prices were heard to be as high as $2.50 per litre at some stations. Now this is about where I would like to see our gasoline prices! This picture shows the price on October 8th, 2005. It shows the price at the corner of Credit Valley Road and Erin Mills Parkway Esso at 95.5 cents per litre. I have not logged the actual prices on Friday's or weekends compared to during the week, but my feeling is that gas stations often will raise the price on a Friday and keep prices high until at least Sunday morning. This is even more true for a long weekend, the price of gasoline usually is raised and stays high for any long weekend that I remember over the past few years. I cannot recall a long weekend where prices dropped, until the weekend of Thanksgiving in 2005. It's incredible and just goes to prove that just when you think you have the yo-yoing of gasoline prices figured out, "they" go ahead and throw us another curve ball. Your comments, questions and suggestions are always welcome! So there you have my 5¢ worth! What are your preferences and reasons for using one gasoline station over another, price, convenience or other? I would love to hear your opinions on this subject too,. Mark Argentino Mississauga Real Estate BlogI just switched my blog to my server at bluehost.com not sure if this is better, but I imagine it likely is. Does anyone know if this is preferred over having my blog at a fee hosted site? Hello. This is my first post, not sure if I know what to do, but here goes. I will attempt to put my thoughts and ideas and feelings into this blog over the weeks and years to come.